The past couple of days have been full on with a busy schedule from morning till night at Golf Australia’s National Camp held at the Woodlands Golf Club in Houston. Day one began at 7am with a warm up session using the essential spikey balls and Ramsey belts. Chris Smith (s/c coach) took us through a range of belt exercises to activate the glutes and traps – boy it was good. My coach from Oregon – Coach Ria – came along to see how we Aussies are assisted with our great network of service providers. She joined in on the warm up and I guess you could say it was something different! We all then had breakfast at the resort before heading to the golf course for practice. Sports Psychologist, Neale Smith, came out to talk to everyone about a range of topics to further improve our mindset for golf during both practice and competition mode. I learnt a lot from Neale and I look forward to taking the advice on board. I personally took the point of “living in the now, the present” – something I always try to live by but having another friendly reminder was good to hear. Following Neal’s talk, I endured through a tough session with Chris at the gym and luckily had a physio treatment with Matt Green (he got his elbow right into my right trap and knots)! Finally to finish off the day I dipped into the ice bath for 4 minutes (it felt more then that for sure) to recover the body after a long day of training. It was a wrap and a few girls and I made our way to Chipolte (they say it’s like a Mexican Subway) – absolutely devoured my meal. Ahhh its freeezinnnng, time go by quicker!!!! 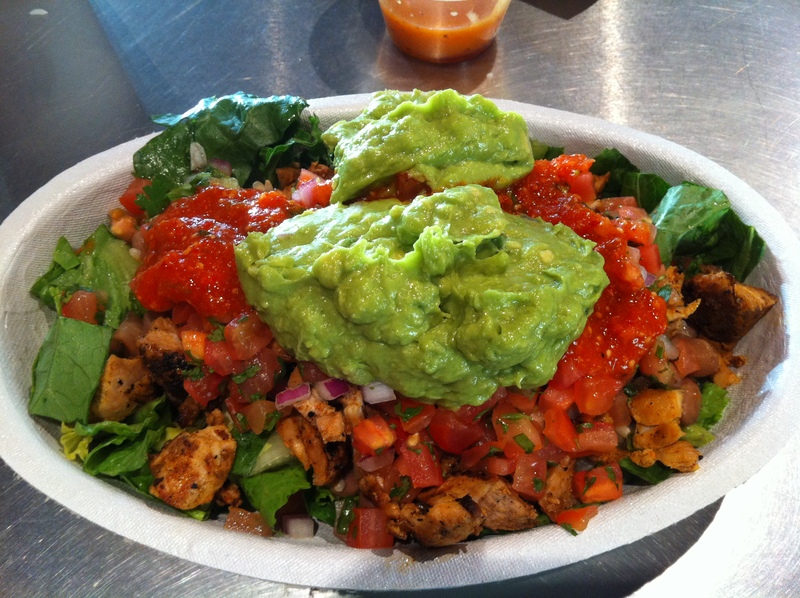 A salad bowl topped with brown lime rice, chicken, tomato salsa, hot sauce and guacamole. I woke up on Day 2 feeling sore (especially in my glutes) which called for a big stretching warm up session to start the day. I then got hooked onto the 3D Biomechanics machinery where Ryan Lumsden helped me out by analysing and explaining to me the results in relation to what I am working on in my swing. It was great to hear what he had to say and I recorded the notes down to work on in the next month. Next stop was the gym for another session with Chris before seeing Greeny again. I am so glad I pushed myself physically and to then be treated afterwards was a good relief! 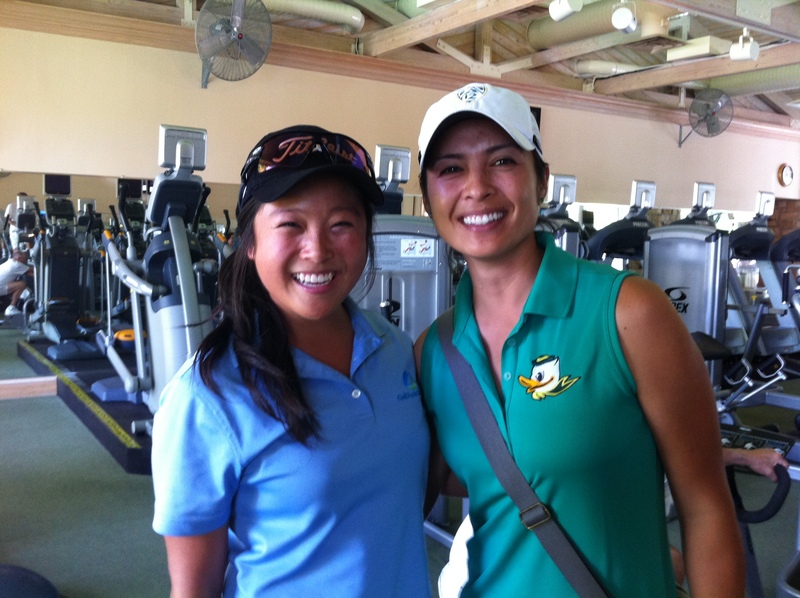 Lunch came by and former LPGA player, Susie Redman, joined the girls for lunch to give an insight on her time on the tour. Being able to hear her story (the good and challenging times) was very inspiring and something for all to learn from. After lunch I jumped onto trackman and did some wedge testing. I began hitting shots to the marked distances, ball after ball, before Gareth told me to maybe work on what Neale had advised on the day before – to practice how you would do it on the course (pre shot routine etc). And guess what? The results were instantaneously better! Even though it took more effort and time to do so for each and every shot, it was worth it. Quality over quantity. Finishing work on trackman I went on to work on the chipping to then have the heat power through to me – so I headed for shade and a gulp of cold iced water. Enduring through the Texas heat was a great test for the mind and body so I made sure I kept hydrated. After a good rest I went out and hit a few more golf balls to work on my technique. 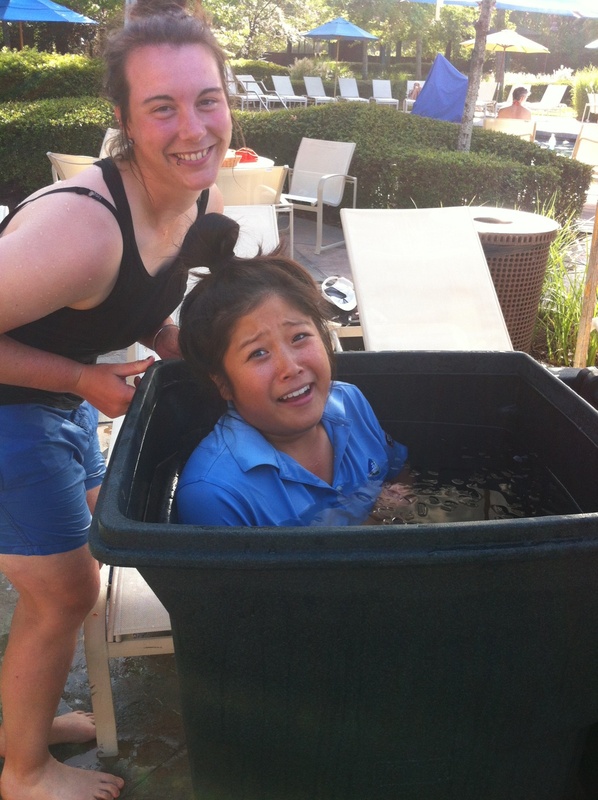 By the end of the day I was exhausted and the ice bath was needed – it wasn’t to bad the second time. 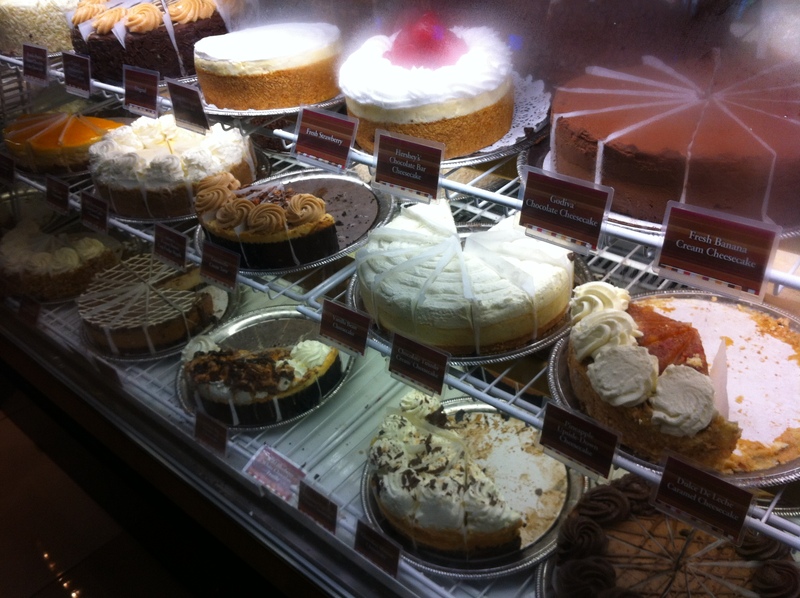 The girls and I then went to dinner at the famous Cheesecake Factory (don’t worry there was an actual dinner menu – it was very long!). 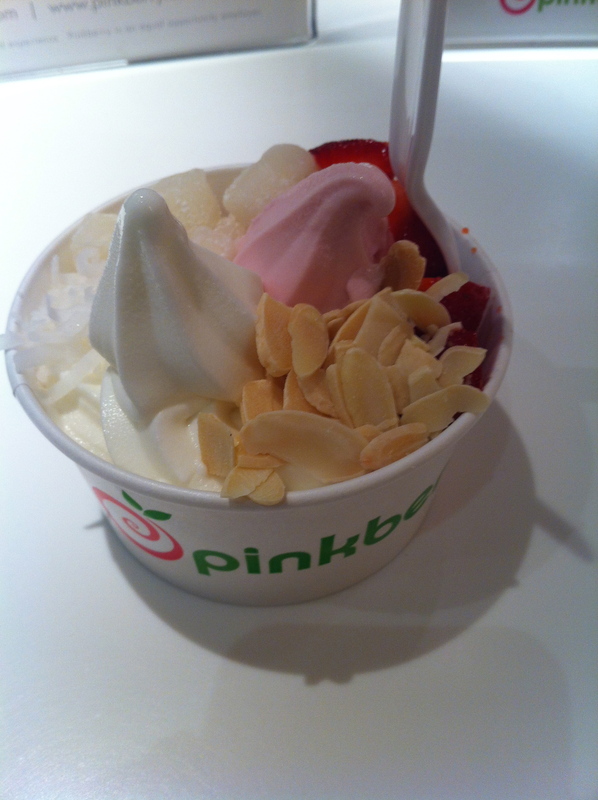 Afterwards I indulged in a frozen yogurt cup from Pinkberry YAY – finally had froyo – nomnomnomnom! 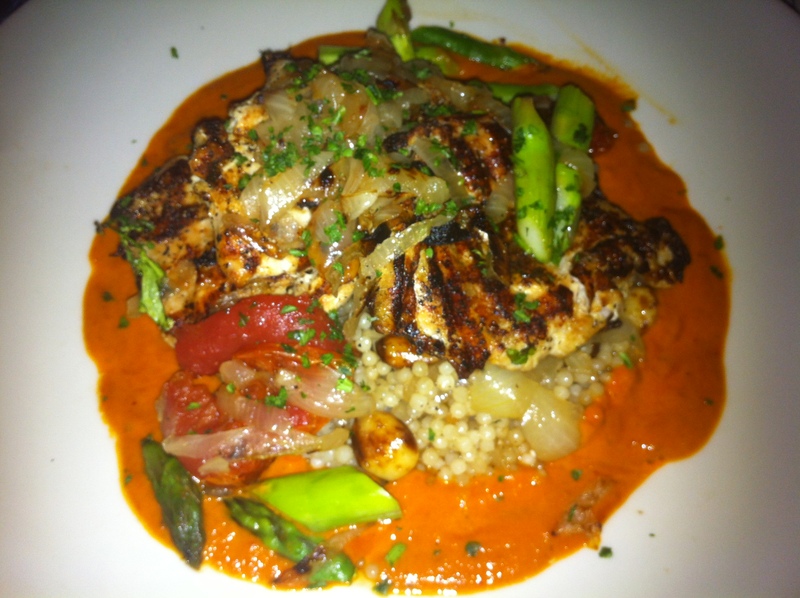 Moroccan chicken over a bed of cous cous with asparagus and onion with a hot sauce on the side. Original and Pomegranate with mochi, coconut, almonds and strawberries. It was an intense two days at Houston and it was great to check-in with all the coaches. I learnt many new lessons and can’t wait to practice over the next month before college tournaments begin. I just flew into my new hometown Eugene and am staying in one of my teammate’s house. I’ve pretty much met everyone on my team and I love my duck family 🙂 AHH college life is just around the corner!